When asked what kind of person he was, three of his classmates, without any consultation among themselves, responded in exactly the same way. 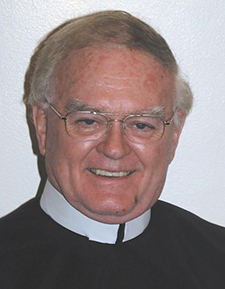 “He was a very peaceful and kind person,” said Father Joseph Freund. “He brought tranquility to the community,” agreed Father Tim Keating. “He was a peace-loving individual,” echoed Father John Lavin. “He would never engage in harsh conversations or even in topics that led to quarreling. He was a great listener, which is probably why so many people came to him for counseling and advice. “When it came to mission and ministry, especially for people who were in crisis, I know from personal experience that Father Douglass brought healing and love into many homes and hearts that were broken,” said Very Reverend Jerome Chavarria, the Vice-Provincial Superior.